This title offers solid and in-depth instruction from a watermedia expert and top author. It includes tips and techniques for developing a personal style. Quiller is a well established name is the art world. He has sold over 100, 000 books worldwide.Join renowned artist Stephen Quiller on a journey of art discovery and exploration. Part One looks at watercolours, with illustrations of it's visual characteristics and their effects with different paper surfaces. Part Two focuses on acrylics, gouache, and casein. In Part Three, Quiller shares his secrets for the most difficult aspect of painting - developing a personal style and vision. 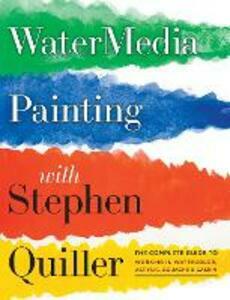 Packed with Quiller's thoughts and ideas on painting philosophy, this is an inspiring guide to living a creative life and creating art.